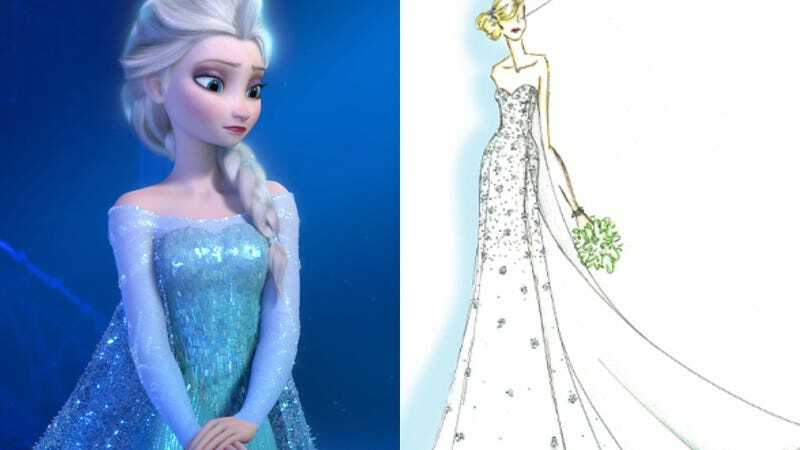 If you're looking to ride your Frozen fandom into a new chapter of your life, great news: Soon you'll be able to acquire a wedding dress inspired by Elsa. It'll match your ice sculptures perfectly! To start the design process, [Chief Creative Officer Michele] Piccione looked at the moment in which Elsa transforms and "finally embraces her icy powers" during the song "Let It Go," a tune so magically voiced by Idina Menzel. "We wanted to translate Elsa's inner beauty and individuality into a sophisticated gown that exudes this," says Piccione. Of course, if you really want to match the glitter of the original, what you'll really need is obviously a $10,000 PNINA. I've seen enough Say Yes to the Dress to know that much. Photos via AP Images, Alfred Angelo.